Shaw wood floors incorporate many different processes that define the look of their natural hardwood flooring. Factors such as species of the tree, where it grew, rate of growth, part of the tree being used, are all carefully considered for they all determine your flooring's unique character. Also, the closer a plank is cut to the center of the tree, the darker its overall tone. Lighter boards came from closer to the bark. Knots indicate that a limb grew from that spot. Growth rings, determined by climate trends and mineral and nutrient absorption, determine grain pattern. While all these characteristics impact the appearance of finished boards, they do not determine the strength. Strength is a factor unique to the individual species being considered. For example, comparing a piece of oak plank flooring to one made from pine, one notices right away that the pine is more susceptible to denting and marking than the oak due to it's inherent 'softness'. This doesn't make pine any more or less desirable than oak for they both have their own unique qualities. This category is identified by subtle character marks with refined grains and even color tones. These carefully selected inner cuts from the heartwood portions of the tree provide an elegant, flowing visual that will accentuate the beauty of any room. Characterized by significant differences in grain size, random mineral marks, and moderate variations in color. 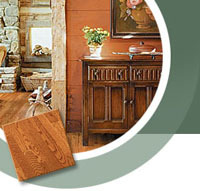 Classic wood floors exhibit a traditional beauty and richness that makes them popular from generation to generation. Broad variations in grain and color, distinguishing knots, and mineral streak highlights are unique characteristics of rustic wood floors. Each installation creates a natural charm and warmth that makes a distinctive design statement in any home. Experience a new dimension in laminate flooring with Shaw's unique VersaLock flooring system. This revolutionary product advancement allows your floor to be installed quickly and without glue so there's no messy cleanup and you can walk on it right away! This is made possible by a patented locking technology that reliably secures the flooring panels on all four sides without adhesive. As an added bonus, a VersaLock floor is warranted against moisture damage and can be easily taken apart and reassembled. Shaw's VersaLock Laminate flooring collection includes an impressive array of traditional, rustic, and exotic wood grain designs that will enhance any room in your home. The collection also includes unique tile patterns with the classic look and feel of natural stone. And with VersaLock, installation is a snap! For more information on Shaw flooring, please click on the links below.